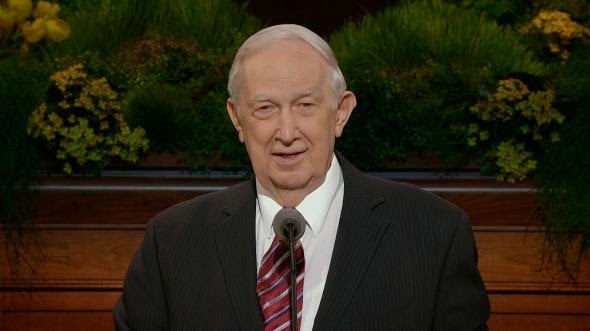 Elder Richard G. Scott spoke of the examples he has followed in his life. When he was growing up, Elder Scott remembers his grandmother, visiting her grandsons, concerned that the boys not baptized. She facilitated that event. Elder Scott benefited from continued support from faithful grandma throughout his formative years. Her example changed the course of his life. These people and the example they set helped Elder Scott to choose the correct path for his future. They knew he could do more with God's help than he could on his own. We love those we want to help. Giving help through your love can help others find help from God's love. Our example must be grounded in principle and doctrine in the Gospel. We must understand the Plan of Salvation. To help those we love, we ask them questions that make them think. The challenge is to help your loved ones to want to obey. As we seek to strengthen families, it may take a long time, and we must be patient. As companion to love, trust. Keep your sharing of the Gospel simple. The Savior is the perfect pattern for everyone in life.